It is a condition in which the human eye shows false appearance of crossed eye. In this condition the eye may show misalignment but in real there is no orthotropic eye (not misaligned). The eyes appears to be crossed. Patients having pseudo strabismus can lead to the eye misalignment in future. The patients with this disease have flat nose but with increasing age the nose bone will become thin and the epicanthic folds (layers of the skin above the eye) will lighten or disappear. The eyes will appear big or wider than before. This condition normally exist in pediatrics. Pseudostrabismus can be seen as a result of different structural changes of face like shape, size and orientation (directions) of orbit, also the size and shape of globes, the thickness and volume of the specific tissue known as reterobulbar tissue. All these reasons can show a pseudostrabismus eye. • Hypertelorism can also be the cause of pseudo strabismus. • Orbital tumor, a minor cause of this disease. The most common cause of pseudo strabismus is the epicanthic folds above the eye and also large distance between the eyes can cause this condition to happen. 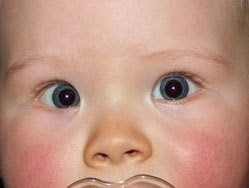 Presence of epicanthic folds (semilunar folds of skin running towards the side of nose) in children (whose facial features are not totally developed) is the one main symptom of pseudo strabismus. The other symptoms associated may be crossing of eye and telecanthus (the increase in distance between medial canthus of both eyes). The nose will be flat and more widen than normal. The eyes appears to be misaligned but in fact they are not. The vision of the patient may not be effected because it is not a disorder of the eye it is just an apparent condition. There is no treatment assigned till now for pseudostrabismus. This condition fully recover itself with age and time passing. Parents should regularly check the appearance of epicanthic folds to avoid any severity. If the epicanthic folds persists then a surgery can be done to cut down the extra mass running down and surgery will be only best If the patient is young because the younger the better. There may be many exercises for the uplifting of mass and narrowing of nose bone. Parents should consult their child with an ophthalmologist I this condition persists or long time duration. As far as Pseudostrabismus test is concerned there is no specifically designated test for such disease. However, your healthcare provider may perform routine examination of eye via machine which may reveal any underlying disease e.g cornal ulcer, polycoria or Pseudostrabismus.